The class action flood gates have opened. Less than two weeks after Uber Technologies agreed to pay up to $100 million to settle class-action lawsuits in California and Massachusetts in which drivers sought to be reclassified as employees instead of independent contractors, the ride-hailing company has been slapped with two new cases. Lawyers in Florida and Illinois have filed similar nationwide class-action lawsuits on behalf of Uber drivers who say the San Francisco company violated the Fair Labor Standard Act. They seek to recover drivers’ unpaid overtime wages and work-related expenses. The lawsuit filed in the U.S. District Court of the Northern District of Illinois goes a step further and tries to recover tips that were “earned but stolen by Uber, or were lost due to [Uber’s] communications and policies." 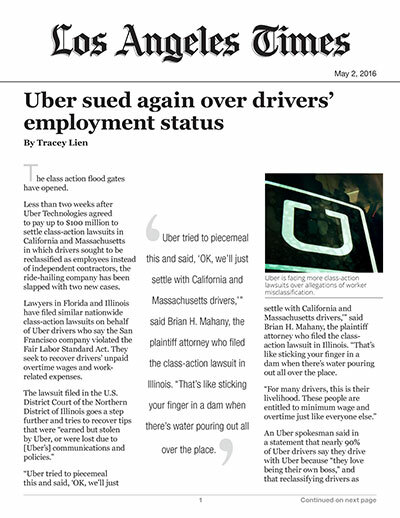 “Uber tried to piecemeal this and said, ‘OK, we’ll just settle with California and Massachusetts drivers,’” said Brian H. Mahany, the plaintiff attorney who filed the class-action lawsuit in Illinois. “That’s like sticking your finger in a dam when there’s water pouring out all over the place. An Uber spokesman said in a statement that nearly 90% of Uber drivers say they drive with Uber because “they love being their own boss,” and that reclassifying drivers as employees would remove that flexibility. “As employees, drivers would have set shifts, earn a fixed hourly wage and lose the ability to drive with other ride-sharing apps,” the spokesman said. The company faces multiple state-specific lawsuits around the country, which claim that it violated state labor laws in the way it classified its drivers. The Florida and Illinois cases seek to cover a nationwide class, although the latter excludes California and Massachusetts because of the pending settlement in those states. When two similar nationwide class-action lawsuits are filed against the same defendant, typically only one is allowed to proceed, according to labor law experts. It is not yet clear how the Florida and Illinois cases will play out, but it is not unusual for plaintiff attorneys to work together. Meanwhile, the settlement in California and Massachusetts still awaits approval by a judge. If approved, Uber would pay up to $100 million to drivers in both states. As part of the proposed settlement, the company recently changed some of its policies to offer drivers more transparency when it comes to driver termination. The company also agreed to stop telling passengers that tips are included in the fare. Unlike rival Lyft, Uber doesn’t give customers the option to add a tip at the end of a ride; as part of the settlement, drivers can now solicit tips. Despite these changes, Richard Reibstein, an employment attorney who heads the independent contractor practice at law firm Pepper Hamilton, said the flurry of follow-up lawsuits was predictable. “Uber has placed in motion, with its proposed $100-million settlement, a rush to the courthouse by other drivers and class-action lawyers for their piece of Uber,” Reibstein said. “Uber had to anticipate that this would have occurred."